Gartner's 'Top Ten Strategic Technology Trends for 2016' report states that by 2020, 25 billion devices will be generating data about almost every topic imaginable. This is equal parts opportunity and challenge. There will be a plethora of data, but making sense of it will be the trick. Typically, IoT goes beyond the machine-to-machine communications and covers a variety of devices and applications. Consequently, analytics is used for predictive decision-making using data generated from these M2M and IoT devices thus making it imperative for IoT companies to have an in-depth knowledge of analytics so as to realize their full potential to develop futuristic products. India now houses vendors who have built their ecosystem around IoT and many IT firms are partnering with such vendors to explore and build innovative industry solutions. They firmly believe that despite the challenges, those companies that are capable of harnessing the power of the tidal wave of information that IoT delivers will leapfrog competitors in the process. There definitely is a reason behind this; the reason being that if done right, the business benefits IoT can deliver surpasses the cynicism it projects. 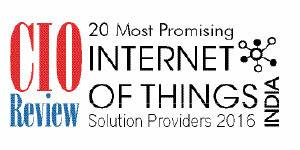 In an effort to help businesses figure out prime vendors who can help surpass this dark side, CIOReview have rounded up a list of ‘20 most Promising IoT Solution Providers’. Closely scrutinized by a panel of judges that encompasses CEOs, CIOs, CXOs, analysts and the CIOReview editorial board, these vendors can be rest assured to battle the everyday challenges like privacy, security, cost and connectivity issues that enterprises face. We present to you CIOReviewindia 20 most Promising IoT Solution Providers-2016. Altiux Innovations Offers Product Engineering IOT Services for Engineering Analytics, Mobility Solutions, Design - Industrial/UI/UX and Smart Devices. Altizon Systems Provides a cloud based IoT Platform for Operational Efficiency, Predictive Maintenance, Remote Monitoring & Consumer Insight. Ansys Designing IoT devices to for Engineering Simulation, Design Optimization, Consulting and Grid Generation. Cascademic Solutions Delivers Plant monitoring & Access control, Asset management & Monitoring Smart Home Automation and Remote Tracking Solution. Chipmonk Extending an IOT platform and end-to-end IOT solution engineering for Condition Based maintenance of Plants, Asset management, Energy Management, Remote monitoring and Control. CloseConnexions Provides IoT, M2M, wearable technology, mobility and advanced analytics to provide digital health and personal safety solutions. Cooey Technologies Providing Health monitoring IoT platform to collect, analyze and manage health related data of patients. EIGEN Technologies Enabling IoT platform to provide products and services for Wireless Sensor Networks, VLSI, Wireless Technologies, Photonics, M2M and Embedded Wireless. Eilabs India Delivering IoT platform to design products and wearables equipped with GPS trackers for human safety. Gaia Smart Cities An Internet of Things Solutions company that creates solutions for Smart Cities, Managed Services, City Command Centers, City Grade, Industrial Grade and Consumer Grade Solutions. MachinePulse Endowes IoT industry with service offeringsfor Data-as-a-Service, Machine Learning-as-a-Service and Analytics-as-a-Service for multiple domains. Maven Systems Designs IoT based solutions for automatic meter reading (AMR), Remote health monitoring, Vehicle / personal tracking & logistics and Lighting automation. National Instruments Enabling IoT integrated hardware and software platform for engineering solutions for measurements, automation and embedded. Onebee Technology Furnishing Smart Home IoT Device to automate and control all the electronic & electrical, gadgets and appliances via mobile devices. Prime Numerics Furnishing IoT based product platform for ERP, Reporting and Analytics solutions. SenseGiz Design and produce IOT & Wearable products, IOT solutions for integration into a wireless mesh network and connectivity to the cloud via a WiFi/GPRS gateway. Sixth Energy Technologies Providing an IoT platform for Remote management, Wireless management of equipment and Energy Management. Teramatrix Technologies Delivering IoT Device Management and Service Delivery Platform for M2M & IP infrastructure monitoring, In-Field Intelligence and Command & Control. Tevatron Technologies Furnishing IoT based solutions for hardware designing, Firmware development, cloud infrastructure setup & programming and apps development. Volansys Technologies Catering wearable products and solutions like connected mailbox, connected home and energy management& monitoring.